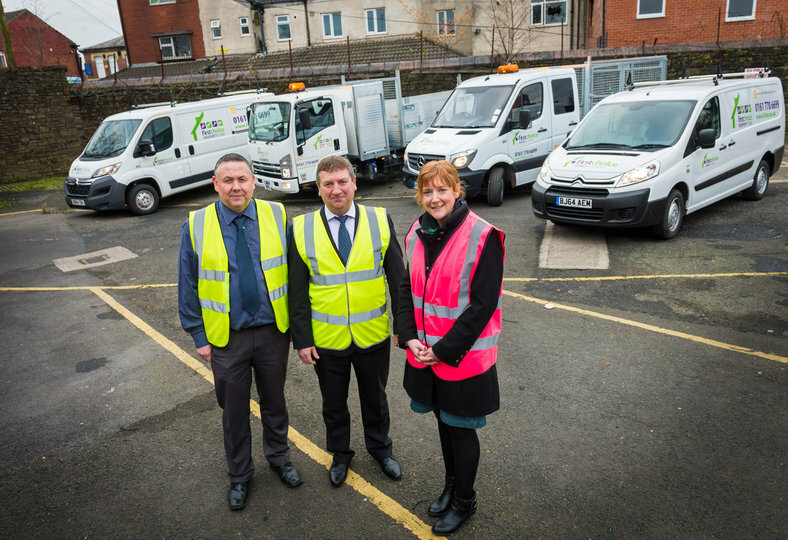 First Choice Homes Oldham (FCHO), which owns approximately 12,000 homes in the Borough, has renewed its contract with Specialist Fleet Services Ltd (SFS) to provide it with a new fleet of 98 vehicles, as well as a five year contract for fleet maintenance. This is the third time that SFS have been successful in winning the tender to manage the vehicle stock for the not-for-profit housing association. SFS was also successful in its bid to manage FCHO accident repairs and specialist vehicle racking installations. The vehicles, which will be used by FCHO cleansing staff, caretakers, and repairs operatives including roofers, plumbers and bricklayers, comprise of Citroen Despatch, Mercedes Sprinters, Isuzu and Citroen Relay vans. Some of the vehicles are being fitted with tipper bodies or cages built by vehicle convertor specialists, TGS Group in Bristol. Most of the vehicles will be delivered and in operation by the end of 2014. As part of the five-year contract, to maximise local spend and opportunities, SFS has sourced local companies to assist with the provision and maintenance of the vehicles. The vehicle livery will be carried out by Grlabels4signs and Richardsons Commercials (Oldham) Ltd will be responsible for the repair and routine maintenance of the vehicles, supported by SFS engineers as necessary. Previously part of Oldham Borough Council, FCHO was first set up as an ALMO (Arms Length Management Organisation) in 2002 to manage the Council’s housing stock. In 2011 FCHO transferred to become a Registered Social Landlord, as a result of a majority vote by council tenants, and is now completely independent from the Council. As well as being committed to giving its customers the highest possible quality of service, FCHO supports the wider community of Oldham, through funding opportunities for events and projects, as well as initiatives focused on employment and skills and health and wellbeing.